Specifically designed for maximum stability and simplicity of use, PCL3 Digital® SRA3 labels are based on the versatile and successful PCL™ (A4) format. 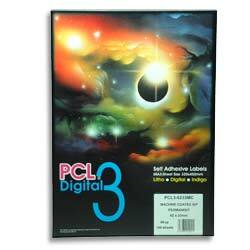 PCL3™ sheets and labels are suitable for use on digital sheet fed presses eg. HP Indigo, Kodak Nexpress, Xerox iGen3, Docucolor, Canon, OCE, Konica Minolta and other sheet fed SRA3 digital presses.